If Alfred can't find the files you're looking for, take a look at these steps to troubleshoot the issue. Alfred uses an intelligent search scope to be fast and efficient. 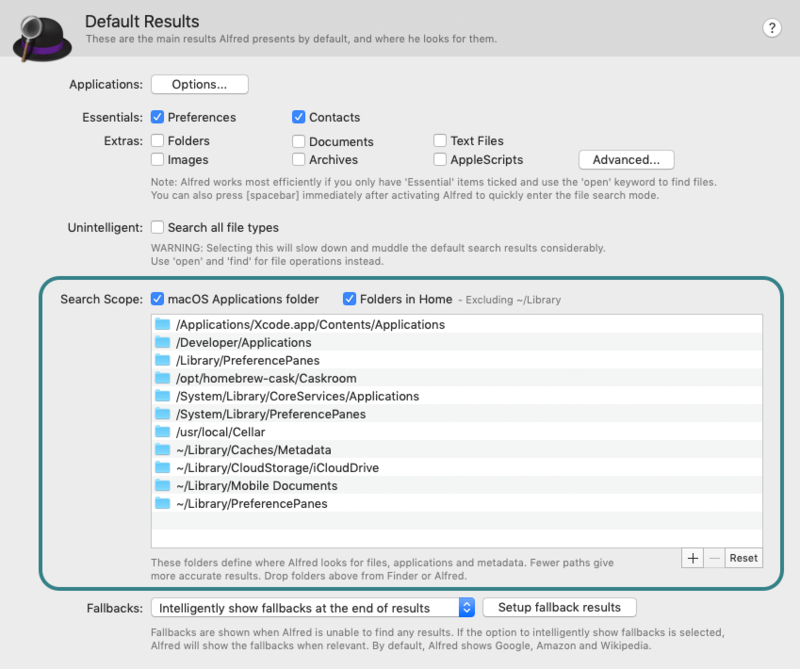 The results included in Alfred's default results include applications, contacts and other file types you've specified in your Default Results preferences. 2. Is your search scope set correctly? Alfred searches for files within his defined search scope. To review your settings, go to Preferences > Features > Default Results. Ensure the file you're searching for is located within your search scope. You can drag in additional folders if your files are stored outside of the existing scope. To keep Alfred's results clean, we recommend use use the spacebar prefix (as in step 1) to search for files but if you're searching for types you want to include in default results (without a keyword or spacebar prefix), ensure these are checked in the Essentials or Extras. If your search scope is correct, move on to the next step. 3. Are your Spotlight Search Results checked? 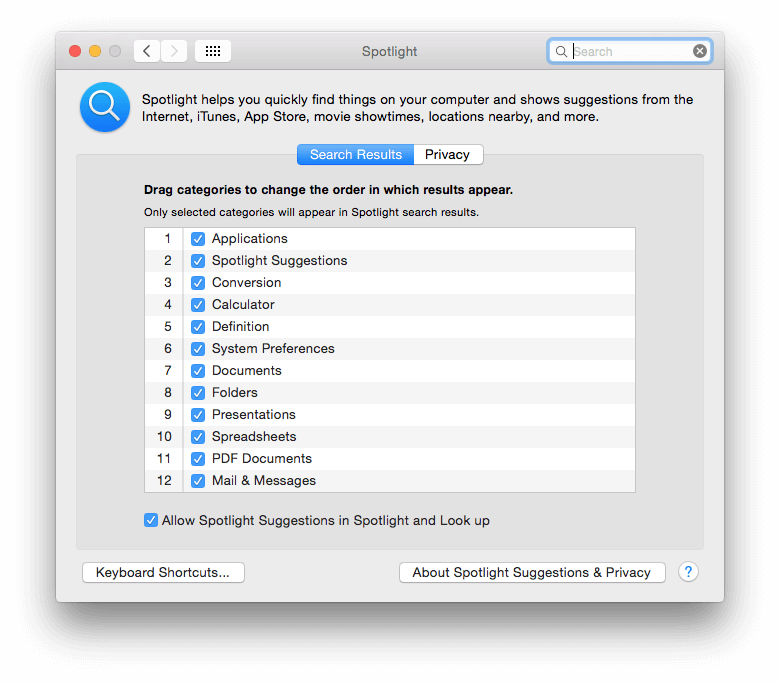 Launch your System Preferences to the Spotlight preference pane to ensure all checkboxes for the file types you want to search are selected. Spotlight allows you to choose which file types are indexed by macOS. As Alfred relies on the same metadata, it's essential that the boxes are checked for all file types you want Alfred to find. Check the second tab, Privacy, and ensure that you haven't inadvertently dragged folders or files to this tab. 4. Can Spotlight find what you're looking for? If Spotlight cannot find the files either, it's likely that the files aren't correctly indexed on your Mac. Alfred and Spotlight use the same metadata gathered by macOS to find results, so if Spotlight can't find the file, the best first step is to reindex your Mac. To do this, go to the Advanced tab in Alfred's Preferences and click "Rebuild macOS Metadata". You'll need to type your password; The characters won't appear as you type, so just keep typing and press Return. Indexing can take up to an hour on older Macs, during which time Spotlight and Alfred's search results may be incomplete, so time for a cup of tea? You should see the message "Indexing enabled" after typing your password. 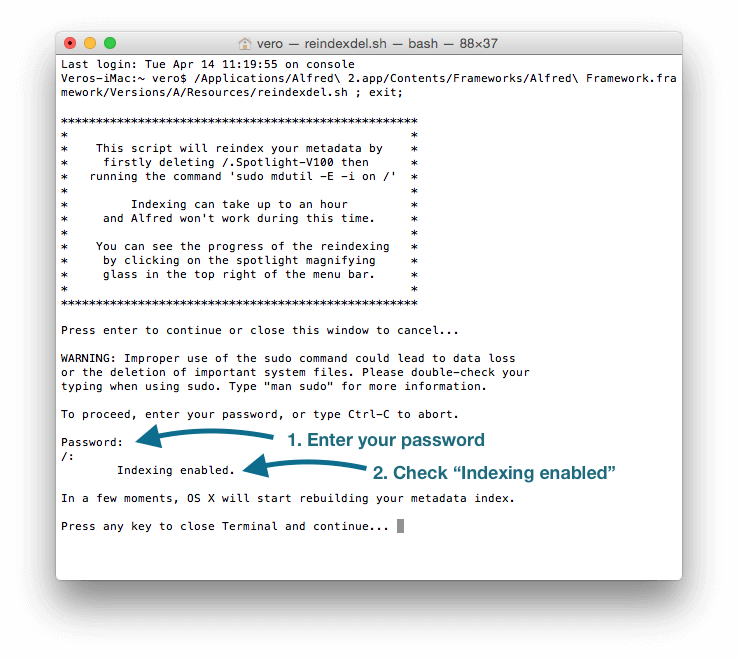 If you see the message "Spotlight server is disabled" or a similar message, you'll need to re-enable indexing on your Mac. Contact us from your Powerpack email address if you're not sure how to re-enable it. Once macOS has finished reindexing, type "reload" into Alfred to refresh his cache of your Applications. If you notice that Alfred appears to find an application that Spotlight doesn't see, this can be because Alfred has previously cached the application. Typing "reload" into Alfred will refresh the cache so the app will disappear. You'll then need to perform the indexing step above. If Spotlight finds your file and Alfred doesn't, move on to the next step. 5. Is your application cache up to date? If you are looking for an Application, it's possible that your application cache has somehow become outdated. Type the word "reload" in your Alfred window to refresh your app cache. You're still here? Check the next step. 6. Are you searching for the correct file name? Ensure that the name of the file you're searching for is accurate, as you may be searching for a file name that doesn't exist. Consider using the * (star) character as a wildcard if you only know part of the word you're searching. If you're still unable to find files on your Mac, get in touch and give as much detail as you can on your situation and the steps you've taken. What file are you searching for, where is it located on your Mac and what file type is it? Can Spotlight find the file, or can neither Spotlight or Alfred find it? Are you struggling to find a single file or many? How can I perform an mdls on a file? Can Alfred work without Spotlight?